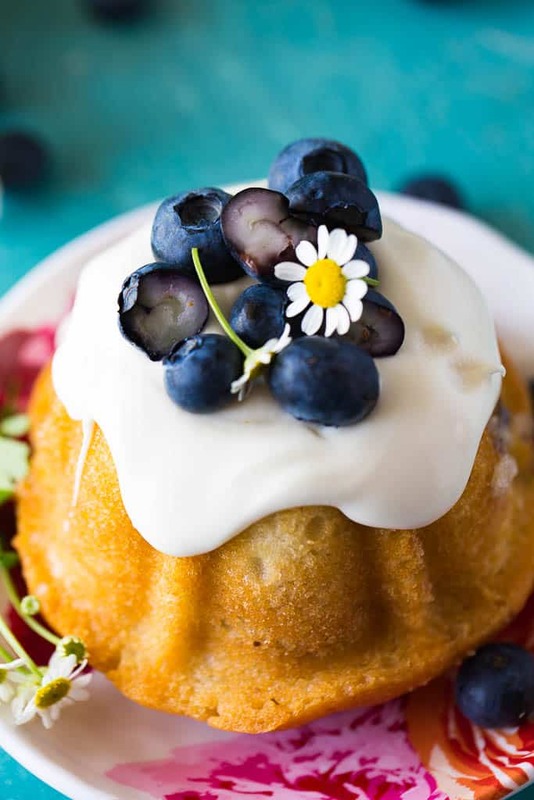 These Mini Blueberry Bundt Cakes are single-serving sweet treats loaded with fresh blueberries and topped with homemade cream cheese frosting. 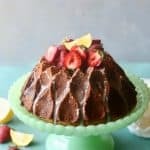 The last time I made mini bundt cakes was February when I made elegant, fun, pink-hued (thanks to fresh strawberry puree) Strawberry Mini Bundt Cakes with Chocolate Ganache. If you can believe it, I haven’t picked up my mini bundt cake pan again until now. That means it’s been five months since a mini bundt cake has been in my kitchen! If you love mini desserts like I do, that’s an unacceptable period of time. 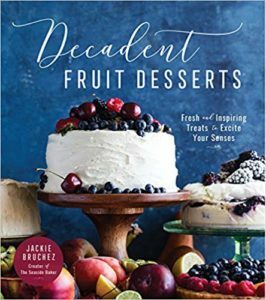 I’ve just been so busy making everything from Mexican Shrimp Ceviche to Fresh Blueberry Mojitos to Brookies that mini bundt cakes have been off my radar. 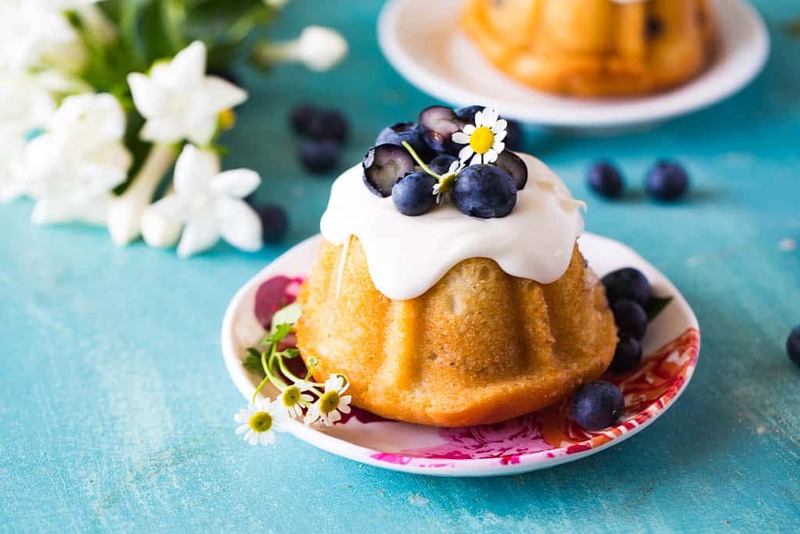 That ends today with these Mini Blueberry Bundt Cakes. 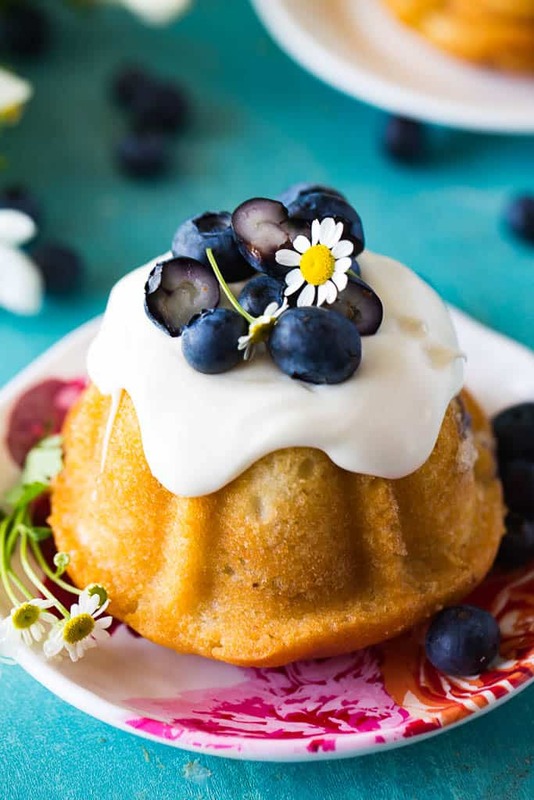 Mini Blueberry Bundt Cakes are moist mini cakes that are bursting with blueberry flavor. 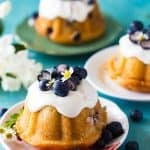 Topped with a sweet cream cheese frosting and fresh blueberries, they have all the delicious components of a full-sized blueberry bundt cake in miniature form. What is especially nice about mini bundt cakes is they’re already portioned into the perfect serving size. 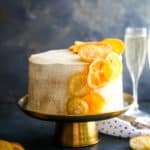 No need to dirty a big knife cutting your cake into slices and no need to worry about accidentally cutting a slice too big or too small…. 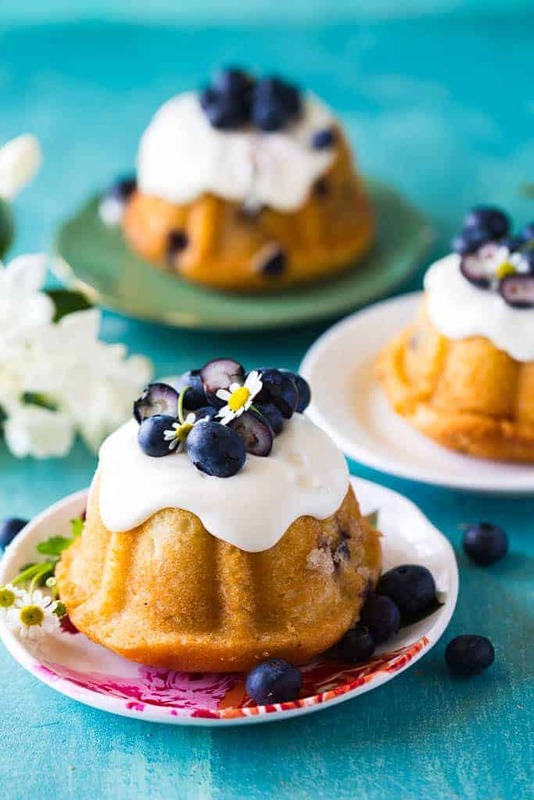 these Mini Blueberry Bundt Cakes couldn’t be easier to serve! 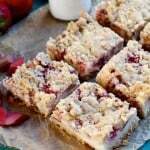 They’re ideal for parties and other get-togethers because they’re ready with no extra effort. They’re ready for guests to pick up and enjoy! Last but certainly not least… they’re quite cute. Who doesn’t want to dive into a cute-as-a-button blueberry-topped cake like this one? 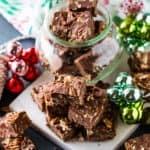 You will love making them (it’s easy to do) and your guests will love eating them. 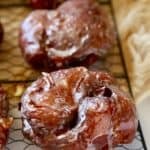 If you like Mini Blueberry Bundt Cakes, make sure to also check out my Strawberry Mini Bundt Cakes- with White Chocolate Ganache and my Samoa Cake- Mini Bundt Cakes. Enjoy! 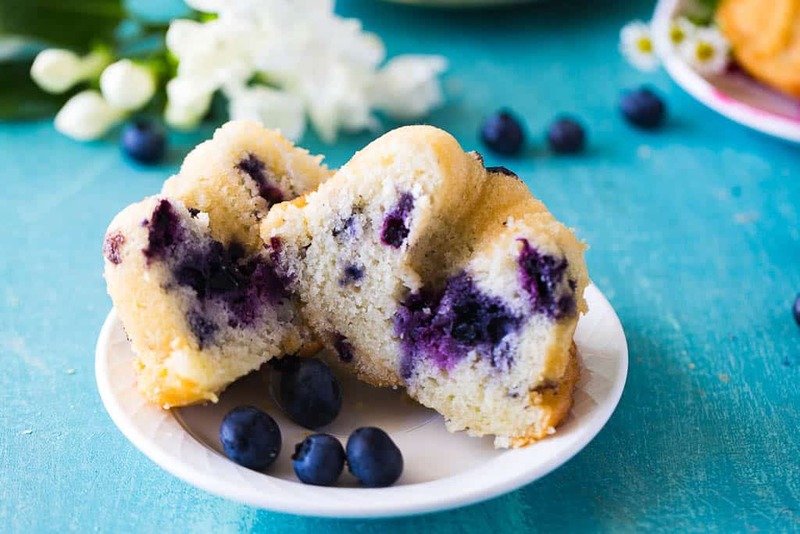 These single-serving sweet treats are loaded with fresh blueberries! Spray mini bundt cake pan with non-stick cooking spray. Stir in extract and fresh blueberries. Spoon batter into mini bundt cake pan, filling each crevice 2/3 way full. 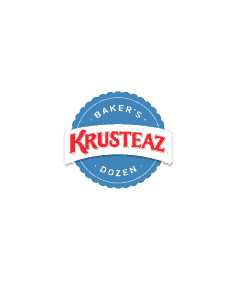 Bake for 20-23 minutes or until a knife inserted near the centers comes out clean. 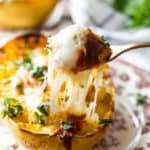 Remove from oven and cool in a pan on a wire rack for 5 minutes. To make the frosting, beat the cream cheese and butter together until smooth. Add the powdered sugar and vanilla and beat on low until incorporated. 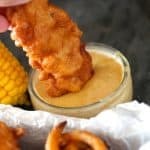 Increase mixer speed to high and beat for an additional 3-4 minutes. 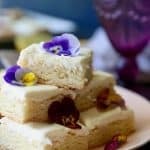 Spoon frosting over cakes and top with fresh blueberries. How many mini blueberry cakes does this recipe make? Thank you. It makes about 6 depending on the size of your mini bundt pan. I used the larger mini pan. 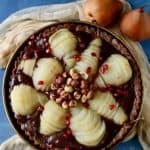 Do you add the flour after step 6?